Cincinnati Bengal's wide receiver A.J. Green seemed to have a rough outing in 2017. 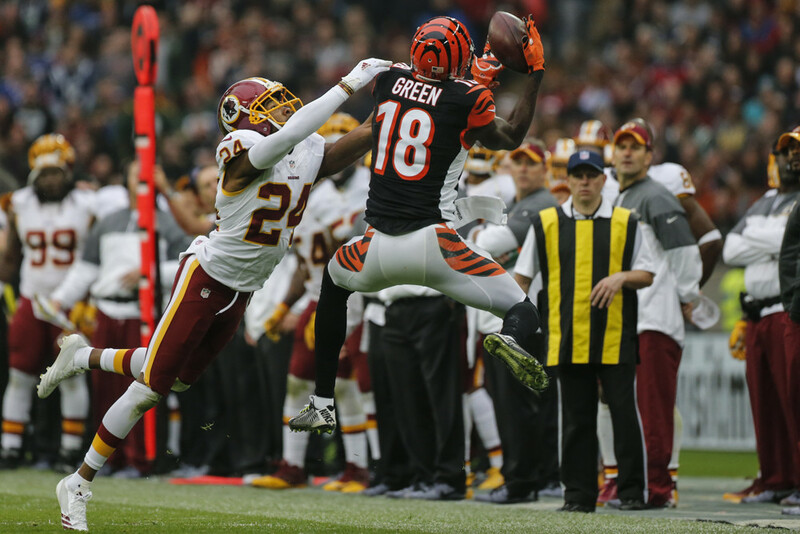 After an injury ended a promising 2016 season (in which Green had 964 yards in 9 games), fantasy players had high expectations for Green the following season. He was being drafted in the first round at 1.10, and was the 5th wide receiver off the board. A.J. Green ended 2017 with 75 catches for 1078 yards and eight touchdowns, which was good enough for 10th in PPR for wide receivers. This might seem fine, but fantasy owners probably remember him as being very inconsistent, often having games where he'd blow up, followed by games with two catches. Owners probably also remember Green's frustrations boiling over against the Jaguars, where he was ejected for fighting. Fighting is very uncharacteristic for Green, but proves that he was frustrated with a bad offense. The Bengals had an awful offensive line in 2017, and Andy Dalton was often running for his life. Unfortunately Green suffered due to this. 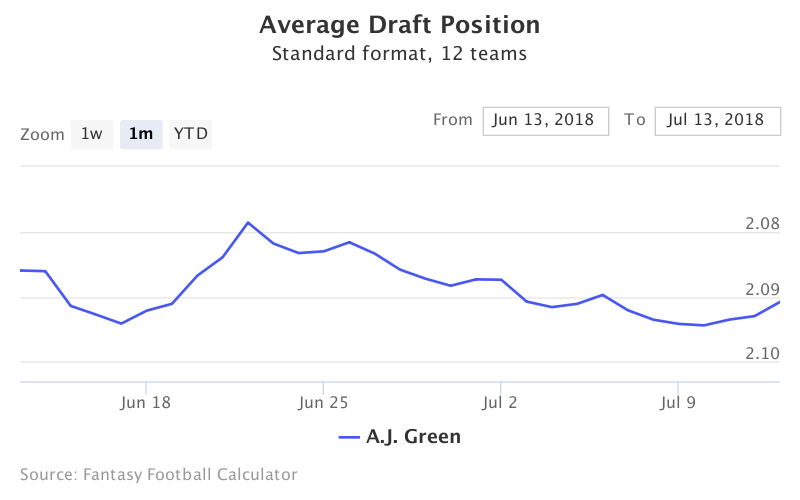 Green is currently being drafted at the end of the second round (2.08) in 12 team PPR drafts. He is the 8th wide receiver off the board. His draft position over the past month has been fairly consistent, usually going between 2.08 and 2.10. Green may gain a bit of traction going into the 2018 season, so it won't be surprising if he starts to climb a few spots. The Bengals knew their offensive line was bad last year, so they addressed it in the offseason. First they signed FA Bobby Hart (OT) from the Giants. Then they traded for OT Cordy Glenn. Finally, they drafted C Billy Price from Ohio State in the first round. These upgrades should not only help Andy Dalton stay in the pocket longer, but it should also make the run game more dangerous. Usually a good run game opens up the pass game and play action, which would benefit Green immensely. With an upgraded offensive line, Green should have a much more consistent season in 2018. He hopes to get back to the 2016 form, where he was on pace for over 1500 yards. With this upgrade, A.J. Green could easily be a steal at 2.08 in PPR drafts. He has fallen a whole round between the start of the 2017 season and the 2018 season, but has a very good chance to outperform his ADP.